We would like to invite you to the annual year end gathering as a follow up and a preparation for next year. One of the central themes of the development of the Universal Peace Federation (UPF) is the Peace Council that was proposed at the founding of the UPF as a place for people from many backgrounds to join together to discuss goals and strategies that can influence a nation or a city in a good direction. It was proposed as a forum for the exchange of ideas and experiences. The Peace Council was proposed as the forum to bring together national level people of many backgrounds in order to pool their efforts. 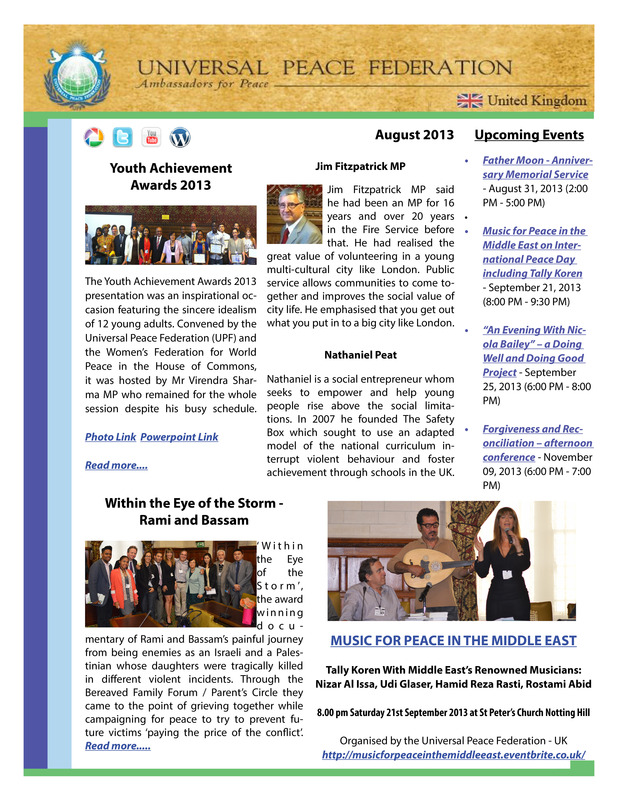 UPF in the UK is known for holding events and activities such as commemorating special UN Days such as World Interfaith Harmony Week, UN Day of the Girl, International Women’s Day, World Interfaith Harmony Week, Prevention of Sexual Violence in Conflict, Youth Engagement in Politics, as well as Sustainable Development Goals and Climate Change conferences. We are also known for human rights events, interfaith activities, promotion of the family and the development of Youth UPF. We are a partner of Parliament Week and Youth UPF held a workshop on youth political understanding during Parliament Week 2015. We have held a series of events to raise awareness of human rights issues of sexual violence in eastern DR Congo and Conflict Minerals. 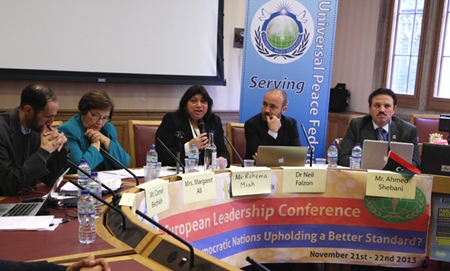 During this Peace Council 2015 we will have contributions from some of the Directors of UPF. They will explain a three year activity and fundraising plan for 2016 – 2018. We have a plan to focus on inter-religious programmes, Importance of the Family and how help strengthen the Family, finally on Peace building, centred on Inter Religious, Inter Racial and Inter Communal, Cooperation as well as Peace Activities. There will be contributions from several Ambassadors for Peace. These will include Cecilia Hallstrom from Malmo Central Mosque in Sweden and Saoussen Ben Cheikh who will explain her work on the Turkish border with Syria with refugees from the Syrian conflict. She has been working with Medicin Sans Frontiere for several years and now working with another charity. There will be a few reports / models of good practice including Birmingham and South London. 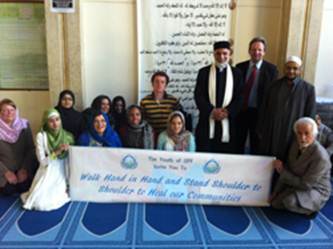 During our Peace Council on December 5th 2015 you will be joining Ambassadors for Peace, UPF members and activists from different parts of the UK. There will be a number of notable speakers present on the day who have been part of our regular activities throughout the year. If you have not renewed your UPF Membership, it is only £30. If you join before the Peace Council (or at the reception desk on the day), where entrance to the Peace Council will be £5 instead of £12 to cover lunch costs. Tickets can be bought online in advance to reserve your place through this link. Otherwise it will cost £12 to attend the Peace Council. Please let us know any dietary requirements. The Peace Council was proposed as the forum to bring together national level people of many backgrounds in order to pool their efforts. 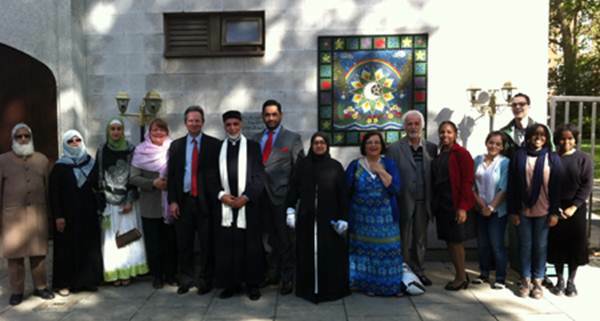 UPF in the UK is known for holding events and activities such as commemorating special UN Days such as World Interfaith Harmony Week, UN Day of the Girl, International Women’s Day, World Interfaith Harmony Week, as well as Sustainable Development Goals and Climate Change conferences. We are also known for human rights events, interfaith activities, promotion of the family and the development of Youth UPF. We are a partner of Parliament Week and Youth UPF held a workshop on youth political understanding during Parliament Week 2015. We have held a series of events to raise awareness of human rights issues of sexual violence in eastern DR Congo and Conflict Minerals. 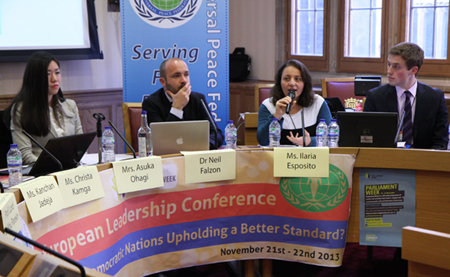 During this Peace Council 2015 we will have contributions from some of the Directors of UPF. They will explain a three year activity plan for 2016 – 2018. We have a plan to focus on inter-religious programmes, importance of the family and how to strengthen the family, finally on peace building, centred on inter-religious, inter-racial and inter-community cooperation as well as other peace activities. There will be contributions from several Ambassadors for Peace. These will include Cecilia Hallstrom from Malmo Central Mosque in Sweden and Saoussen Ben Cheikh who will explain her work on the Turkish border with Syria with refugees from the Syrian conflict. She has been working with Medecins Sans Frontieres for several years and now working with another local Turkish charity. Annual Membership is only £30 if you join before the Peace Council (or at the reception desk on the day), where entrance to the Peace Council will be £5 instead of £12 to cover lunch costs. Otherwise it will cost £12 to attend the Peace Council. Please also reserve the date December 5th in your diary for the pa or go this link for more information. others. Sheikh Dr Hojjat Ramzy, a UPF Director, will be conducting an Auction extraordinaire with some wonderful items. During the evening Keith Best, also a Director will be speaking about UPF’s ideals as well as his experience of 30 years of public service. Keith, a former MP, is the Chair of the Executive Committee of the World Federalist Movement from 1987. He has been the director of Prisoners Abroad between 1989-1993. In 1993, he became Chief Executive of the Immigration Advisory Service. In 2003, he was named among the most influential top one hundred people in public services in the UK. In the beginning of 2011 he became the CEO of Freedom from Torture. ​We hope you can join us for a great evening to celebrate the values that bring us together to have an impact on this world. Tickets can be obtained through this linkor by sending us a cheque payable to Universal Peace Federation, 43 Lancaster Gate, London, W2 3NA. You are cordially invited to Eritrea: Business Ethics, Migration and Trafficking. This is the third part series on Eritrea and the development of Business and Human Rights and Corporate Social Responsibility. This panel discussion will look at the key issues facing Eritrea from the development of its natural resources through to migration and trafficking. Mr Todd Romaine, VP Corporate Social Responsibility, Nevsun Resources Limited. Todd will discuss business operations in Eritrea and the recent CSR Report and the company’s vision to generate shared prosperity through its business operations. This objective means much more than just generating economic benefit. It also means protecting the safety and health of employees, mitigating environmental impacts from its activities, respecting the human rights of its workers and the residents of the communities in which it operates, and contributing to the sustainable development of those communities. Lloyd Lipsett, LKL International. Lloyd is an international human rights lawyer with over 15 years of experience working with leading companies, governments, national human rights institutions, civil society organisations and indigenous peoples. He has developed a niche in the field of human rights impact assessment with a focus on extractive industry projects and free trade agreements. He has special expertise on indigenous peoples rights, economic, social and cultural rights and stakeholder engagement. Indira Kartallozi, Chrysalis Family Futures. Indira is the founder and director of Chrysalis Family Futures – a social enterprise that stands for protection and empowering of human and socio-economic rights of vulnerable and marginalised families and children. Indira has 15-year experience and on issues of migration and human rights. Her work with Chrysalis Family Futures has taken her to various countries in Africa, Europe and Latin America. Simon Tesfamariam, Trafficking in Eritrea. Simon is the founder and director of the Red Sea Institute, an Asmara-based think tank, whose mission is to advance sustainable peace, economic development, and social progress in the Red Sea Basin and Horn of Africa sub-region. He is an active blogger on Eritrean issues and has written extensively on human trafficking and migration. He received his B.S. in Biochemistry from the University of Washington and is currently a student at Duke University School of Medicine. We are honoured to invite you to attend a celebration of Africa Day 2015. We are happy to share this day with our friends and partners in the event. There are more full biographies below. Africa Day is a wonderful opportunity to celebrate the achievements of a fast growing continent. There are many inspirational examples from nations like Botswana that is relatively free of corruption and has free education and health due to a growing economy based on diamonds. The family culture, (which really means the extended family) that is prevalent throughout Africa. The religious nature of African people. 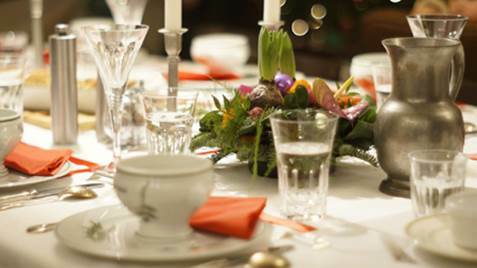 The music and foods of different parts of the African continent, which always creates a welcoming atmosphere. The world comes to Africa for minerals and other resources. There is so much more to Africa to learn from and gain inspiration. UPF International celebrates Africa Day each year. 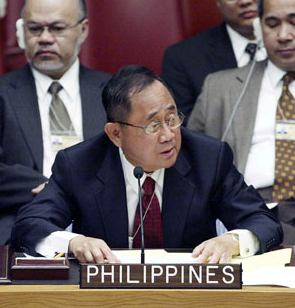 Several times this has been in the Manhattan Centre in New York with the UN Secretary General, Ban, Ki-Moon. It reflects the partnership between the African Union and UPF. There will be African food, music, cultural wisdom, story-telling and clothes. Please come and celebrate with us. Kindly RSVP to reserve your place. 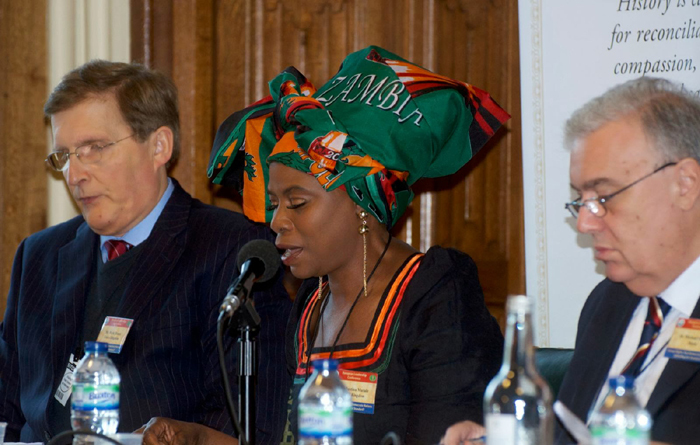 Acclaimed as one of the most influential and inspirational women of African origin, Justina Mutale is the AFRICAN WOMAN OF THE YEAR 2012, an honour bestowed upon Justina on the same platform as Archbishop Desmond Tutu of South Africa as well as the former President of Malawi, The Rt. Hon. Joyce Banda and the former female Deputy Prime Minister of Zimbabwe, The Hon. Thokozani Khupe. Justina is also Honorary Ambassador for Gender Equality, a UPF Ambassador for Peace and a Spokesperson for the INTERNATIONAL WOMEN’S THINK TANK, which is headquartered in Atlanta, Georgia in the USA. Founder of POSITIVE RUNWAY, Global Catwalk to stop the spread of HIV, Justina has been featured as a Hero in the Capital Finance International Journal, which brings coverage and analysis of the drivers behind change by combining the views of leading multilateral and national organizations with thought leadership from some of the world’s top minds. Having gained global recognition for her ability, as a public personality to use her status to potentially influence the thinking of both Africans and non-Africans alike, Justina is featured among the 365 of Africa’s most respected names, well-known faces, and influential voices who inspire the future, motivate the young generation, and raise the profile to positively alter the perceptions of Africa and Africans around the world. The Mother of two and entrepreneur was recently listed in the Black Women in Europe Power List as the most powerful and inspirational black women in Europe. Pauline Long is the founder of Europe’s biggest award ceremony, the BEFFTA AWARDS, that celebrates and honours black and ethnic personalities in entertainment, film, fashion, television and arts. She is also the founder of Mr and Miss East Africa UK. She is a UPF Ambassador for Peace. As a passionate community personality and philanthropist, she mentors many youth in the industry and supports unsigned artists through her award-winning film studio, East End Studios. She hosts the Pauline Long show, a premier global TV talk show with a global audience broadcasting live from London on SKY 182-BEN TV, discussing current issues, politics, economy, beauty, fashion, entertainment, film, charity and more. New Global Witness research shows EU must do more to reduce deadly #conflictminerals trade: http://t.co/aJeA9LM7N9 EU trade in tin, tantalum, tungsten and gold (‘conflict minerals’ when sourced from DRCongo for example) was responsible for almost a quarter (€28.5 billion) of the global trade in tin, tantalum, tungsten and gold ores and metals, which was worth over €123 billion. South African Superstar and Legendary Singer, YVONNE CHAKA CHAKA will be in London next week. Ms Chaka Chaka, who is a UNICEF & Roll Back Malaria Goodwill Ambassador and Founder of Princess of Africa Foundation will hold the London premiere of her film: “A MOTHERLAND TOUR: A Journey of African Women with Yvonne Chaka Chaka” which will be screened in the wings of the 58th BFI London Film Festival. Ms Chaka Chaka will also be a Keynote Speaker at the Conference on “AFRICA RISING: THE ROLE OF THE DIAPSORA AFRICAN WOMAN”, which will be hosted by the Rt. Hon. Baroness Verma, Under Secretary of State for Energy and Climate Change at the House of Lords, Westminster Houses of Parliament on Thursday 2nd October 2014. The Women’s Conference will discuss the role of women in the rise of Africa, with special focus on the need for the Diaspora African Woman to constructively engage with the current exciting and transformative moment in Africa’s history. 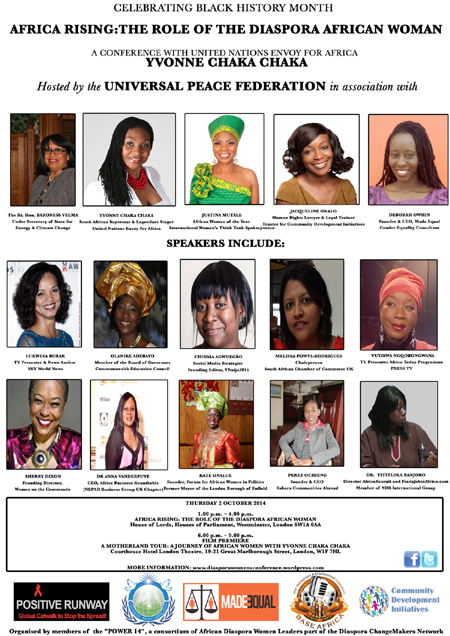 The Conference aims to provide delegates an opportunity to gain insight and join discussions about the realities, obligations, obstacles and opportunities for the Diaspora African Woman in Africa Rising. The Conference has been convened by members of the “POWER 14″, who include Justina Mutale, Founder & CEO of POSITIVE RUNWAY, who is also African Woman of the Year 2012 and Gender Equality Ambassador & Spokesperson for the International Women’s Think Tank; Jacqueline Onalo, Human Rights and Immigration Lawyer at R. Spio & Company Solicitors and a trustee of Community Development Initiatives (CDI); and Deborah Owhin, Gender Equality Specialist and Founder of Made Equal, a vision to engage, educate and empower people in their 20s and 30s in the campaign to eradicate gender inequality. World is getting less peaceful. It is official! Posted in Peace and Development | Tagged: Civil Society, human rights, Millennium Development Goals, peace, Peace Movement | Comments Off on World is getting less peaceful. It is official! Youth Universal Peace Federation is a group of young people from different faiths and backgrounds, mostly University students age, that aspire to build a World of Peace. This event, was Kindly hosted by Rt. Hon. Baroness Verma, of Leicester. 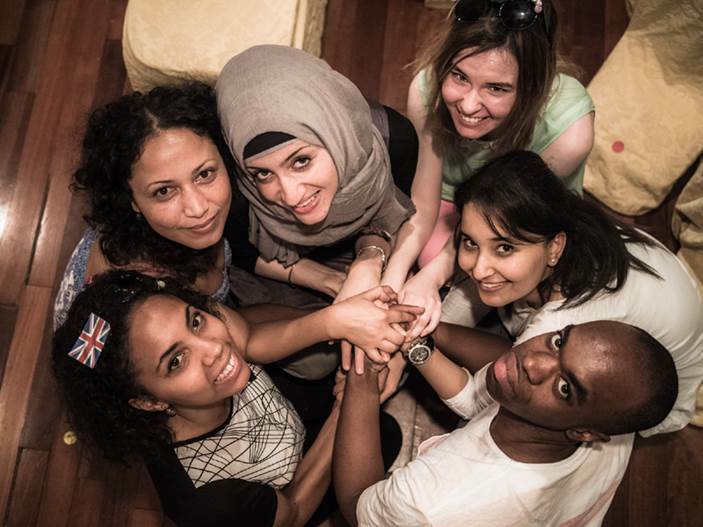 We make UPF’s global peace network accessible for young people – the leaders of the future. Copyright © 2014 UPF & YouthUPF, All rights reserved. 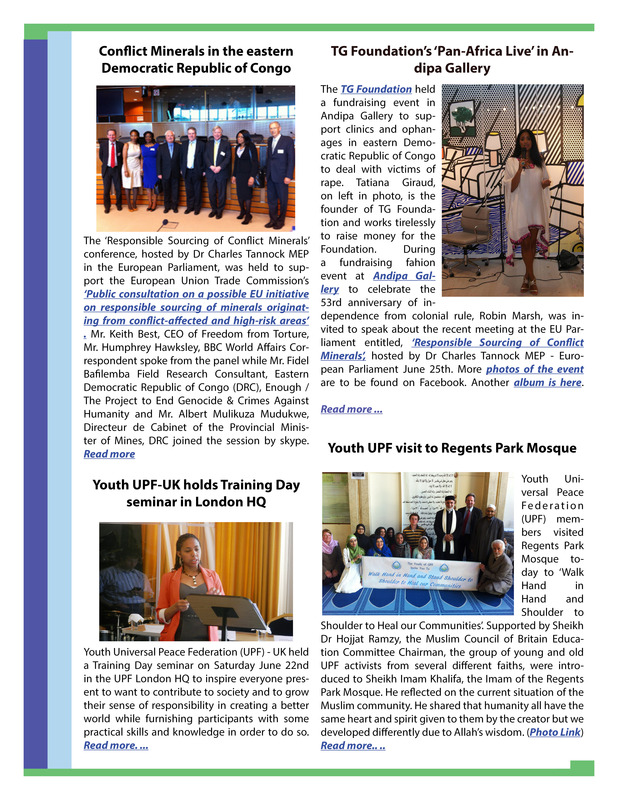 you are receiving this email, because a friend of yours, or yourself introduced you to the YouthUPF and asked us to keep you posted. Universal Peace Federation (UPF) is convening a special program entitled “Geneva: Track II” in Geneva, Switzerland on Jan. 23-25, 2014, concurrent with the “Geneva II” inter-governmental conference that aims to bring about a peaceful resolution of the crisis in Syria.The theme for the consultation is “Toward Peace and Reconciliation in Syria: The Significance of Religion, Faith-Based Organizations and Civil Society.”The tragic and devastating consequences of the conflict war in Syria, both in terms of the loss of life and the millions of displaced persons, is giving rise to a humanitarian disaster of epic proportion. UPF applauds the efforts of the United Nations, the United States, Russia and the participating nations, and seeks to offer support for the success of Geneva II. The intention in convening a wide variety of spiritual and religious leaders, as well as academicians, civil society representatives, women and youth, is to supplement the “track one” initiative of Geneva II, with a “track two” program that underscores the need to engage religious and spiritual leaders, faith-based organizations and a variety of civil society organizations in the pursuit of peace. In addition to the above, participants will be offered a wider range of opportunities to meet and network with high-level officials representing religion, government, academia, the private sector and the media. This follows the Amman Consultation, entitled ‘Amman Conference on Prospects for Dialogue and Reconciliation in Syria’, that was held in 11th -13th October 2013. The Executive Report on the consultation is available from here. First of all thank you for your support this year. We have had a wonderful year at YouthUPF-UK with a lot of great events, our usual projects, The Youth Interfaith Council, an Evening With (Doing Well and Doing Good), the fabulous concert, projects away in Malta and we the last group has just came back last night from Jerusalem. This email will just enclose quick paragraphs from various reflections by the YouthUPF Team, received during the year from the latest projects. Having trouble viewing the email below? Click here! London UK – Justina Mutale, African Woman of the Year and Founder/CEO of POSITIVE RUNWAY: Global Catwalk to Stop the Spread is scheduled to address the European Leadership Conference at the Houses of Parliament and the House of Lords in London, on Thursday and Friday 21-22 November 2013. The Conference is part of the activities of “PARLIAMENT WEEK” and part of a series of major events in National Parliaments including the United Nations in Geneva and Vienna, as well as the European Parliament in Brussels focused on issues of Human Rights, Human Development, the European Relationship with Africa and the Future of Multiculturalism. The ‘conflict minerals’ issue, one of the factors fueling the violence of the eastern Democratic Republic of Congo, has received attention in the US, the OECD and now the European Union. Robin Marsh commented on the ‘responsible sourcing of conflict minerals’ legislation that will be proposed by the European Union Trade Commission by the end of the year. It is an issue that was highlighted in a European Parliament event organised by UPF on June 26th. UPF will hold another event on November 21st in Parliament to discuss ‘conflict mineral’ developments in the US legislation, proposed legislation in the EU and OECD guidelines for conflict minerals. Some companies and mineral federations are making efforts to create protected supply lines that improve the income for miners and the level of state governance. 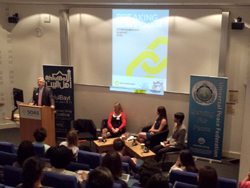 Research results reported by several groups have highlighted problems and the scale of the current illicit trade. These reports include the Enough Project, Striking Gold: How the M23 and its allies are infiltrating the Gold Trade, the Testimony to a U.S. House of Representatives Sub Committee Hearing on ‘The Unintended Consequences of Dodd-Frank’s Conflict Minerals Provision’ of Sophia Pickles of Global Witness, the South Africa Resource Watch’s Conflict Gold to Criminal Gold and the report for German Industry prepared by Oeko-Institute ‘Conflict minerals – An evaluation of the Dodd Frank Act and other resource related measures’ have illustrated many of the issues involved. Whatever proposals Mr Karel De Gucht, the EU Trade Commissioner, announces they will not be made without sufficient study and research of the issue being available. The possibility of a better partnership of the European Union with the people of the DRC that enhances Congolese security and prosperity while Europeans benefit from their resources could be brought much closer through this EU initiative. 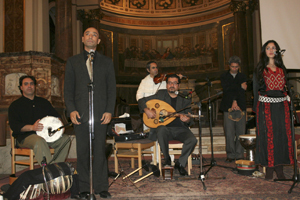 Music for Peace in the Middle East was a celebration of music from different cultures. 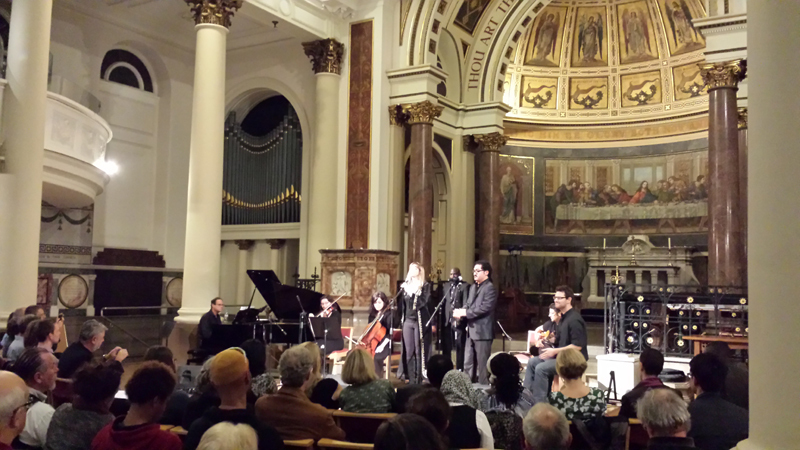 Each person here tonight is supporting the language of love and on this note the first musician, the Persian Hamid Rasti, started playing with his instrument of 72 strings so beautifully. It was just music, peace, hearts beating and calming down in this church. It was just beautiful and every time we turned our heads back more people where coming in. Music has no barrier, as he diligently played and with what looked like chopsticks we all relaxed and he took us on a journey of hope. 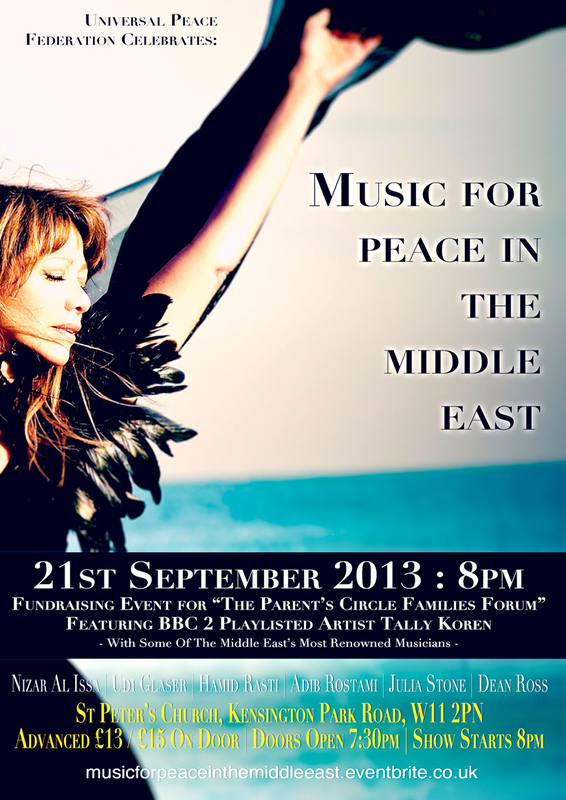 Israeli singer songwriter Tally Koren heads a cast of Israeli and Palestinian musicians in a recital, ‘An Evening of Music for Peace in the Middle East’ taking place on the International Day of Peace, Saturday, September 21 at St. Peters Church on Kensington Park Road W11. 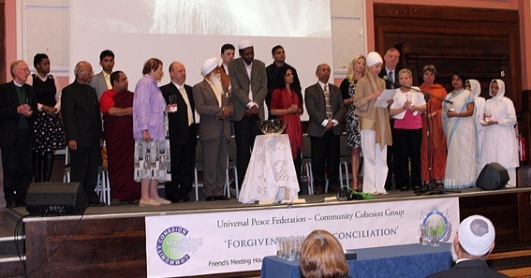 The event organized by the Universal Peace Federation UK is a fundraising occasion for the Parents Circle Families Forum, which helps bereaved Palestinians and Israelis to reconcile their differences as an alternative to conflict. Udi Glaser is a composer (film composer, composer for theatre, etc. ), an accomplished guitarist, educated musician, producer, experienced guitar teacher and music theory tutor. Udi has dedicated his life to music. Unification Peace Rally of 70 nations of the World for the realization of Unification of the Korean Peninsula and the DMZ World Peace Park. The event was held at 11:00 a.m. on August 24th, the day after the commemoration ceremony for the anniversary of Father Moon’s ascension. 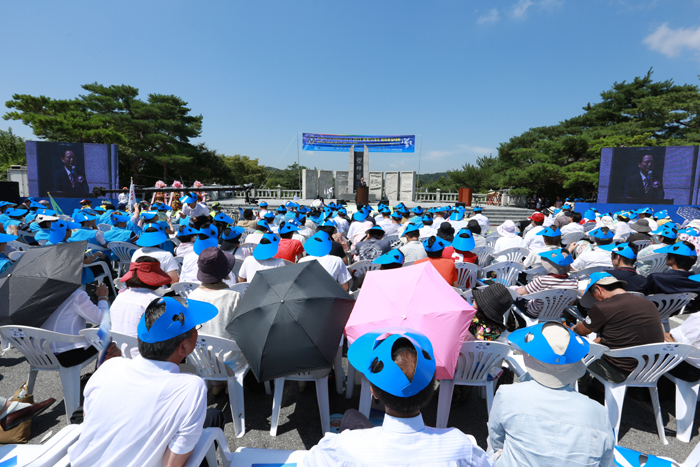 About 1600 people, including 300 Korean residents in Japan, gathered at the Imjingak to pray for the peaceful reunification of South and North Korea. Doves were released expressing hope for the reunification of Korea and the establishment of the DMZ World Peace Park. This followed a condolence message sent from Kim Jong-un, the Supreme leader of North Korea, to Dr. Hak Ja Han Moon, co-founder of the Universal Peace Federation and Family Federation for World Peace and Unification to mark the one-year anniversary of the passing of the Reverend Sun Myung Moon, according to North Korea’s chief news agency. The Korean Central News Agency (KCNA), North Korea’s official wire service, quoted Kim Jong-un, “I pray for the repose of Rev. Sun Myung Moon, who worked for harmony and prosperity of the Korean people, the unification of Korea and world peace.” He added that he wishes that Dr. Hak Ja Han Moon and her family would inherit and carry forward Rev. Sun Myung Moon’s will and also sends his best wishes to their work. Dear Dr. Hak Ja Han Moon and members of the Moon Family. Excellencies. Ambassadors for Peace. Ladies and Gentlemen. It is my distinct honor and privilege to have the opportunity to share with you a few words this morning in honor of the life, the teachings and the legacy of the Rev. Dr. Sun Myung Moon who passed away to the spiritual world one year ago today. I am always moved and uplifted when I come to Cheong Pyeong. My wife, Congresswoman Gina de Venecia, and I have had the very good fortune to have visited Father and Mother Moon on many occasions in this holy place, this holy land. 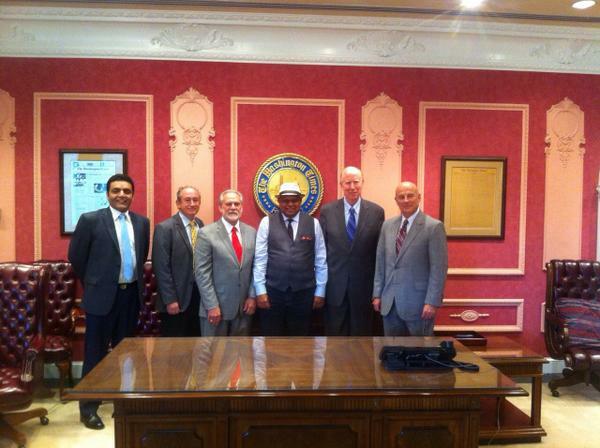 Sheikh Imam Khalifa was grateful for the visit saying that this time of challenges will soon pass. He added that the Muslim community has a good situation generally in UK. Another worshipper after reading the banner and understanding the nature of the UPF visit, extended his blessing to all who had come to visit at this testing time. Robin Marsh expressed that UPF believes ‘humanity is one family under a loving God’ and that is why we had visited today. Sheikh Ramzy shared that the Mosque was a place that was open to all who wanted to pray to God. 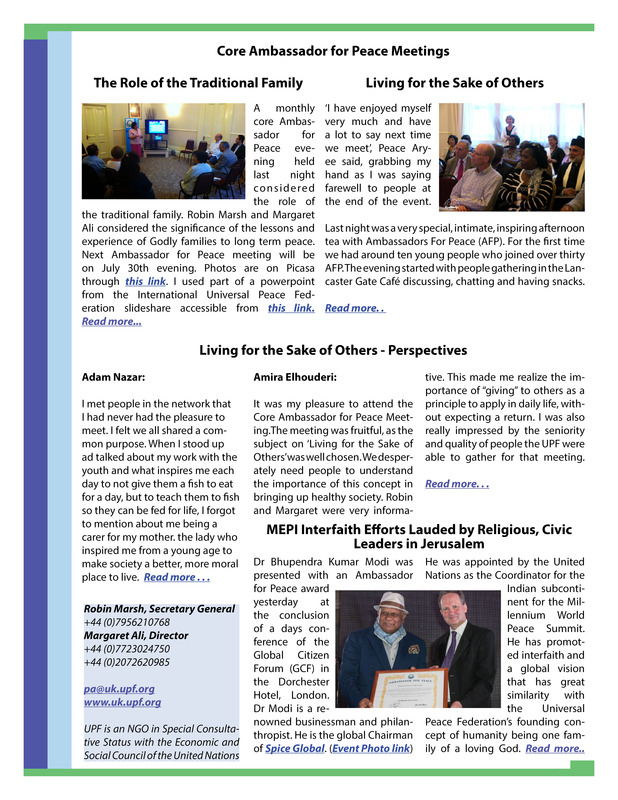 He added that he was proud to be an Ambassador for Peace of the Universal Peace Federation which is a great organisation working for peace in the world. Attending the late afternoon prayers and meeting some of the worshippers, the group was later given a tour of the Mosque which, being built in 1974, is the third oldest in the UK. The UPF -UK, with support from its leading Ambassadors for Peace, released a statement from the day after the murder in Woolwich.